A lovely lady – A few years ago we had the pleasure of hosting, Ann Roberts Rockefeller, it was her 8oth birthday, along with two friends. She is the daughter of Nelson Rockefeller, republican Vice president from 1974-77. She was charming company, completely without snobbery or artifice and taking great pleasure in the simple things of our house and the places we took her to. She enjoyed the garden, picked nettles for her breakfast, offered to produce a plan for its restoration, danced to my fiddle on her birthday. On an unexpected extra day, we took her to Druidstone which she loved and saw a concert with Harry Bird and the Rubber Wellies who she loved.One of our trips ended up at the Transition cafe in Fishguard which interested her very much. She was also interested in our biomass system, a short time after her visit it was reported that the Rockfeller Foundation( built on the wealth of Standard Oil) had removed all but 1% of investment from fossil fuels. The Roberts name came from her maternal grandmother- Elizabeth Roberts Clark. Her mother being a Roberts had welsh ancestors and hence Ann’s visit. They had settled in the Welsh Tract in Pennsylvania , Pencoyd ,Bala Cynwyd. She comes to mind again with two recent events. Here is her acceptance speech (https://www.youtube.com/watch?v=JqIf7FKhfeQ) for the James Parks Morton Award presented in June 2017 for her personal philanthropic fund, Fund of Four Directions.She talks about her great grandfather not caring about the money but wanting a simple life with no cloth on the table and a bowl of porridge and that the wealth was only to avenge his wife’s family who abandoned and shamed her for the marriage to “Wild Bill” Rockefeller, pedlar and philanderer. The speech perfectly captures her philosophy and character. The second item that recalled her visit was in May 2018, her Uncle, David Rockefeller , sold his art collection which yielded £614 million, the largest auction total in history. The collection being the legacy of David, the last surviving grandson of J.D. snr, and brother of Nelson, and his wife Peggy. Most of the proceeds went to charity, though you’d think they might keep back the odd £10m or £20m for the kids . We had to post this review. – + “The Manor was superb. A friend and I stayed three nights in a twin room with washbasin; shower and loo were along the passage. A common space on the landing provided a large TV and a better than usual selection of hot drinks. Very attractive sitting room and library downstairs, where I was able to write with my laptop on a wet afternoon. It was how a B&B should be: one felt like a real guest (though one left undisturbed by one’s host except at breakfast), not a commercial customer. Beautiful garden too. We moved to a more run-of-the-mill establishment for the South Pembs part of our trip, and definitely noticed the contrast! (The S. Pembs. one – where one would NOT have wanted to spend a wet afternoon – was more expensive too! )” – No criticisms at all. Springwatch special from Pembrokeshire March 25th 2016 – Watch the special Springwatch programme on Friday on BBC2 – includes film from Skomer Island , Stackpole and Freshwater West. We are fully open now and almost sold out for the easter weekend but plenty of opportunity next week for a visit to Pembrokeshire. Cuffern Manor receives a Green Key Award – Cuffern Manor receives one of the first Green Key awards in Wales. http://goo.gl/Xlyl0q Green Key is an eco-label awarded to around 2,400 hotels and other sites in 47 countries worldwide We were pleased to visit Tenby on April Ist to receive this award from Richard Hammond (“Not the bloke on Top Gear (though I’ve got used to the disappointment when I turn up to review a hotel and the owners are expecting to meet the TV celebrity and not me). But anyway, here I am, the founder of greentraveller and generally the bloke who looks after the site.I have worked in sustainable transport and tourism media for over 17 years, including writing a weekly column in the Guardian, a monthly column, The Responsible Traveller, for Geographical magazine (the magazine of the Royal Geographical Society), editing the travel section of Green magazine (distributed by the Guardian), and a column, Go Green, in National Geographic Traveller magazine.) Being ‘green’ means different things to different people. In tourism it is easy to see how tourism can destroy the environment that attracts people in the first place. Richard told the story of the person who wasn’t sure if he had been on holiday to The Gambia or The Dominican Republic. We know that our guests want to experience the unspoilt beauty of the coast, the islands and the wildlife, curated for us by the National Park. We know our guests like the fact that our food comes from our own organic garden or from independent local producers, not just for quality but also because our suppliers spend their money locally as well, keeping our economy bouyant. We also have invested in green energy through the installation of solar PV panels and a biomass pellet boiler, removing the dependency on oil and most of the gas we previously used. We also value and support the locality around us through a variety of community intiatives which we hope adds in a small way to the quality of life here. So thanks Green Key and Keep Wales Tidy, who manage the scheme in Wales, for giving Cuffern Manor this recognition. Green Key aims to • raise the awareness of leisure establishment staff and clients, • increase the use of sustainable methods of operation and technology, • run ecologically sound and responsible businesses, and thereby • reduce resource, energy usage Green Key is presently the largest global eco-label for accommodation and has a national administration centre in each participating country. 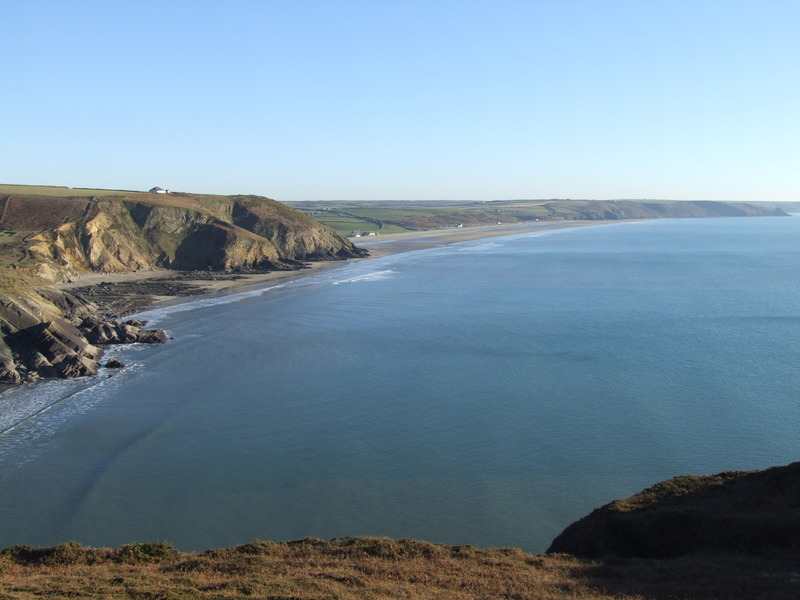 Emerging from the winter tunnel into the pembrokeshire spring – Newgale, as its not been seen for over 20 years, the beach is on the road, the pub and shop are surrounded and the campsite a birders paradise, a flock of canada geese landing when we were there. The driver of a 411 bus travelling east found his bus beached after a wave hit its side forcing the ten passengers to escape through the windows, an incident reported in the national media. The beach has lost a metre of sand , which we know will return as this has happened before, and migratory birds have been washed up. Puffins have also been washed up in Brittany and the wardens return to Skomer shortly to assess any long term impact. We also suffered from two long periods without electricity, one as long as 30 hours. Then , unrelated to the weather, we had a burst pipe in the boiler room quite late at night, leading to the appearance of two or three headless chicken dashing around in pyjamas working out what to do. So the appearance of the sun and the daffodils on St Davids Day has been welcomed. Now we can look forward to our music and dance weekend with John Kirkpatrick March 21-23 and our two nordic walking holidays in April/May. Also the completion of the barn conversion at the end of March all being well.